One of the problems with being able to visit any moment in history, as the non-science-fictional side of early Doctor Who makes abundantly clear, is that the most interesting times in history are also often the most dangerous. The French Revolution is a perfect example—a great boiling cauldron of high-minded idealism, bloodthirstiness, factional intrigue, ruthless ambition, class envy, and all the mad passions of zealots and reactionaries driven to change the world by any means. So much of what we now take for granted as the cornerstones of a civilized society was born in the French Revolution, and yet it also encompassed the worst of anarchic mob rule and despotic tyranny. It was the best of times, it was the worst of times, as some guy once said—point being, no matter how fascinating and important a time it was, you’d probably have to be crazy to want to see it in person. Like many birthplaces, it produced a beautiful baby, but it was also a bloody mess full of screaming and pain. So it’s somehow perfect that it’s this period in Earth’s history that most fascinates the Doctor (and specifically, the dangerously thrill-seeking First Doctor), as his naïve granddaughter Susan casually mentions to her not-entirely-willing travelling companions Ian and Barbara early in “The Reign Of Terror.” It’s easy to see how it would appeal to his own anarchic, rebellious nature, not to mention the contradictory streaks of impishness and moral rectitude that alternately motivates this version of the Doctor, who is after all simultaneously the oldest and youngest Doctor. He hadn’t yet decided if he was a hero or an antihero, so of course he’d love post-1789 France, which hadn’t made its mind up on the question either. The French Revolution, in short, makes such a perfect setting for a historical Doctor Who story that it would have been a crime for the show to have missed it. Luckily, it didn’t, landing the TARDIS just north of Paris in 1794 for the season-one closing six-part serial “The Reign Of Terror”—newly out on DVD with animated reconstructions of the missing-and-presumed-destroyed fourth and fifth episodes. The problem is that, on the whole, it’s pretty dull. 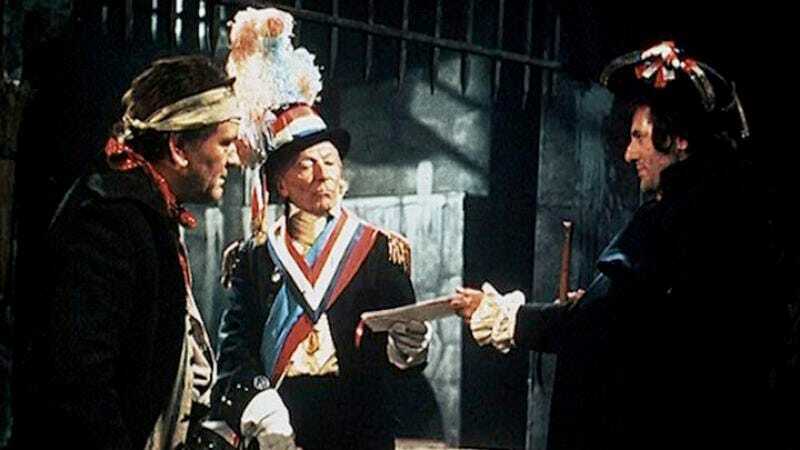 It has some great moments, especially as a showcase for the rascally devious Doctor as he treks across rural France, impudently impersonates a Revolutionary official, and outwits a buffoonish jailer, but “The Reign Of Terror” is a fizzle. I’ll elaborate on that momentarily, but first, it’s worth pointing out that “The Reign Of Terror” is uncannily similar to the last serial I wrote about, “The Visitation,” in terms of its place in the show’s history. Which is to say, this is the first Doctor Who script by Dennis Spooner, who would soon afterwards took over the job of founding story editor David Whitaker, and thus became one of the primary behind-the-scenes shapers of Doctor Who during its second and third seasons, exactly what would happen with Eric Saward and “The Visitation” in 1982. And like “The Visitation,” “The Reign Of Terror” is a showcase of elements that would become characteristic of the Spooner era without, unfortunately, rising much higher than mediocrity in its own right. It starts well, though, with a solid first episode that deals with Ian and Barbara’s fractious but friendly relationship with their kidnapper, the Doctor, and quickly sweeps them out of their comfort zone and into the brutal violence of the Revolution before they quite know what’s happening. In fact, it begins in the middle of what might be an ending—the previous story, “The Sensorites,” ended with the Doctor suddenly becoming furious with Ian and Barbara and insisting he’d throw them both off the TARDIS at the very next stop. Now, he insists he’s brought them back home to 1960s England and huffily waits for them to leave. The teachers, naturally enough, are dubious. He’s never been able to steer the ship that well before, so why believe him? Plus, although they don’t say so to the Doctor directly, they’ve begun to enjoy the life of the temporal vagabond too. So in the interest of good fellowship, as well as keeping the Doctor from abandoning them just in case they haven’t landed in London after all, they invite him out for a quick drink to say goodbye, and coincidentally to verify what year it actually is. But by this point, it’s too late: Within moments, the TARDIS crew is caught between the two armed men from upstairs, who are anti-Robespierre rebels, and a troop of soldiers outside sent to arrest them. The rebels are shot, and the TARDIS crew is arrested. Like orcs, the soldiers argue over them, and decide that it’s more profitable if they take them to Paris in case there’s a reward. As they’re dragged off, the house is set on fire with the Doctor still lying unconscious inside. So far, this is pretty compelling—it moves quickly, creates a real sense of danger, and briefly but effectively sketches what darkness France has fallen under six years after the Bastille; its utopian dreams curdled into thuggish dictatorship. If the episode kept up the momentum and level of inventiveness of the first episode, “The Reign Of Terror” would have been a classic. But it falls victim instead to the number one problem of all mediocre Who serials, stretching too little story over too many episodes, and worse, it keeps retreading the same basic plot of having the characters captured, thrown into the Conciergerie Prison, rescued, recaptured, then escape and be recaptured again. If they’re not in jail at any given moment, then they’re most likely looking for the others who are in jail. Surprisingly, especially considering how long “The Reign Of Terror” is, you really don’t learn much about the era it’s set in. Even though the story covers the end of the Reign of Terror and the rise of Napoleon Bonaparte, those huge events have comparatively little effect on the action as it relates directly to the Doctor and his friends, with Bonaparte’s role in particular just a cameo saying, essentially, “Look! It’s Napoleon!” Robespierre fares better, getting more screen time and even speaking with the Doctor twice. But any sense of what motivated his disastrous time in power is boiled down to a few sentences in episode four. Trapped into an audience with the leader while in disguise trying to free Susan from prison, the Doctor audaciously suggests that Robespierre might have overreached by executing all the political enemies he can find. Robespierre responds with a remarkable rant that moves from idealism to homicidal paranoia (“But I will triumph, even if I have to execute every last one of them! Death, always death!”) and finally to a sad, defeated acknowledgement that it’s all spun out of his control (“What a memory I shall leave behind if this thing lasts”). But while he namechecks other historical figures like Danton and the Girondins, the story never explains who they were or why they mattered. Without that level of detail, there’s very little sense of just what a complicated, contradictory mess the Revolution was, though at least Barbara gets a good speech about not judging anyone’s motivations too harshly after her friend (and lover, perhaps) Leon Colbert is revealed to be working for the other side. Instead, the bulk of the story here is divided into the Doctor’s mission to find and rescue the other time travelers, and (inspired by the 1905 pulp adventure novel The Scarlet Pimpernel) Ian and his insurgent friends’ attempt to bring a message to dashing British spy James Stirling, with both missions threatened by the evil Lemaitre, one of Robespierre’s officials. Stirling’s extended absence and Lemaitre’s apparent ineffectiveness are eventually revealed to be related: Lemaitre is Stirling, and he’s been dragging his feet for four episodes while he decides whether or not he can trust the others, meaning that much of what’s happened so far is not merely boring, but utterly pointless. Another reason “Reign Of Terror” drags is because the the main characters split up into two or three separate storylines lasting nearly the entire six episodes—not exactly uncommon for Hartnell-era Doctor Who, but drawn out badly here. That does have the advantage of helping widen the scope, allowing us to see more of France under Robespierre’s rule. But if the companions aren’t with the Doctor, it eliminates internal conflict between them as a potential source of drama—and Ian and Barbara should, of course, be furious with him for dropping them into a land of chaos and murder to satisfy his own curiosity. Splitting everyone up greatly benefits the Doctor himself, who over the course of the first season had been pulling ahead in the “who’s really the main character here” competition. When Spooner took over as story editor, one of his main goals was to move away from the ensemble mode of season one and make the Doctor the definitive hero of the show whose title bore his name. And you can see that starting here: By keeping the Doctor alone and off on his own adventures for long stretches, “The Reign Of Terror” helped prove he could handle the burden of being Doctor Who’s main character—which indeed he was by the time Spooner left the series. The Doctor repeatedly uses his skills of deceit and trickery to good ends—scheming his way out of a work gang, talking his way into a fraudulent official uniform complete with a pimptastic giant feather waving around on his fancy tricolor hat, and bluffing his way into prison and into Robespierre’s own office. But the worst victim of this is surely the Doctor’s granddaughter. As so often happens with Susan, her potential role in the story is left almost entirely unexplored, and she winds up written as passive; not merely useless in her own right but an inert lump who keeps Barbara from doing much of anything in the story either. What probably should have happened with Susan, if not in this story then certainly before she left the show in “The Dalek Invasion Of Earth,” is that this naïve, often overly-trusting girl should have woken up to just how dangerous the Doctor’s habit of putting curiosity over safety really was. What if, at some point, she realized he’d been taking her for granted in a way that routinely put her life in danger and confronted him about it? She’s his only known blood relative, and yet he’s eventually going to abandon her on a devastated planet and fly away—the first companion, and not the last, to pay a high price for knowing him at all. It might have made one hell of a memorable scene. IAN: Supposing we had written Napoleon a letter, telling him, you know, some of the things that were going to happen to him. SUSAN: It wouldn’t have made any difference, Ian. He’d have forgotten it, or lost it, or thought it was written by a maniac. BARBARA: I suppose if we’d tried to kill him with a gun, the bullet would have missed him. DOCTOR: Well, it’s hardly fair to speculate, is it? I can see why Whitaker insisted on this idea: It’s a sure-fire way to ensure that your time-traveling characters can visit the past without inadvertently obliterating their own present a la “A Sound Of Thunder.” Ian and Barbara’s very first trip brought them to the age of the cavemen—it’s possible their visit might have prevented the development of human civilization itself. The problem with this from a storytelling standpoint is that unless the story itself is about why you can’t change history, as in “The Aztecs,” it kills the possibility of drama stone dead, because without change, how can there be drama? 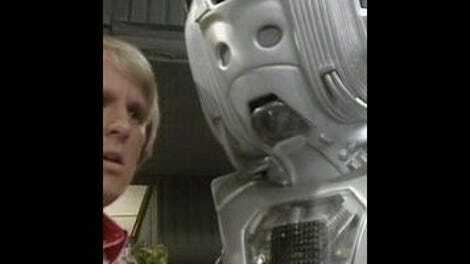 Whitaker gave the series a little wiggle room around this by allowing the Doctor and friends to interact fully with people and events that fall outside the view of the textbooks. This is what happens in “Reign Of Terror”—Napoleon and Robespierre are window dressing, leaving fictional characters like Lemaitre and the cartoon jailer to do most of the talking. But this approach misses the point of why it might be fun to see a story set during the French Revolution; it’s like visiting Paris but skipping the Louvre in favor of touring a few of the local McDonalds. Once Spooner took over for Whitaker, this idea was increasingly abandoned. The Doctor arguably causes the Great Fire of Nero in “The Romans,” and soon after meets another rogue Time Lord who has been actively and successfully screwing around in Earth history in “The Time Meddler.” Doctor Who never looked back. Despite half-hearted notions like “fixed points in time” that crop up in later episodes like “The Fires Of Pompeii,” history is no longer stuck the way we first find it—indeed, by my count, the Doctor has radically revised the entire history of the universe at least three times. But an eternally changing timeline would be just as unworkable for an ongoing series as Whitaker’s unchangeable one, so for the most part, Doctor Who elects to ignore it. This is one reason why almost all the post-Hartnell stories set in the past are “pseudohistoricals” with aliens, not Napoleons, for villains: That way, the Doctor is working to prevent historical change, not cause it. The reconstructed fourth and fifth episodes are superbly done, with greater expressiveness and sense of motion than I’ve seen on any earlier recon animation. A behind-the-scenes legend worth repeating: Director Henric Hirsch, in his only time working on Doctor Who, found the whole experience (and especially cantankerous star Hartnell) so taxing that he collapsed and was hospitalized midway into filming the third episode. Today, none of the surviving cast and crew know who, if anybody, took over for him and directed the rest of it. John Gorrie, the most likely candidate and the one credited with the work, does not remember actually doing it. Leon Colbert is played by Edward Brayshaw, who’s much better known for his role in season six’s “The War Games” as the War Chief.